Festus Keyamo, the Spokesman for the All Progressives Congress (APC) campaign council has insisted that the presidential candidate of the Peoples Democratic Party, PDP, Alhaji Atiku Abubakar, is not a Nigerian. 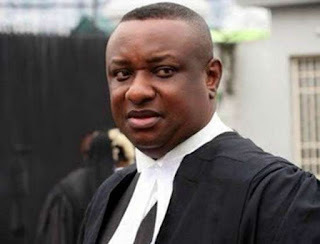 Speaking on Channels Tv on a Sunday night, Keyamo said APC’s decision to test the matter in court was a collective decision reached by more than 18 senior advocates representing the President and the APC at the Election Petition Tribunal. Keyamo, who is a Senior Advocate of Nigeria, however, noted that the matter was already in court and as a senior member of the bar, he cannot go into details about it. He further, advised “those who are informed” to go and read thoroughly Section 131 in conjunction with Section 25 of the 1999 Constitution, as amended. Recall that the APC had on Friday filed a motion at the Presidential Election Petition Tribunal in Abuja by its lead counsel, Lateef Fagbemi faulting the candidacy of Atiku in the election, claiming that Atiku is a Cameroonian and not a Nigerian citizen.